Today, March 29, 2016, The U.S. Supreme Court delivered a decision in the Friedrichs case, recognizing that stripping public employees of their voices in the workplace is not what our country needs. The 4-4 decision essentially upholds the 1977 Abood v. Detroit Board of Education. The OWLS Petition, Reject Friedrichs, Honor Unions, had more than 1,000 signers calling on the court to uphold the union shop, and helped initiate an important conversation within the labor movement of how to fight the growing threat of “Right to Work” — or better called No Rights At Work. Thank you to all the activists who signed the OWLS petition. Let’s celebrate this victory as the discussion begins on how to push back. Below is a petition that Organized Workers for Labor Solidarity has initiated. The online version can be accessed by clicking on the link above. Please sign the petition, post it on facebook, and share widely. Let’s crank up the heat on the Justices! For paper copies, call 206-261-1420. We, the undersigned, support the right of Public Employees to unionize as upheld by the U.S. Supreme Court in 1977. Public Employee Unions have the right to require that everyone they represent pay a “fair share” or “agency” fee to cover the union’s costs to negotiate and enforce a contract that covers all the public employees, even those who choose not to be union members. 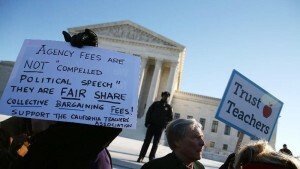 Friedrichs v. California Teachers Association, is a thinly veiled anti-labor attack on all workers and public-sector employees in particular. By accepting this case, after it was soundly rejected by the Appeals Court, the Supreme Court threatens to gut the collective rights of workers and further entrench the power of big business. History proves that strong unions work to level the economic playing field. The weakening of unions correlates directly with the drastic worsening of income inequality and the extreme concentration of wealth among a small minority. We call on the Supreme Court to reject the Friedrichs case in its entirety, uphold the Appeals Court decision and uphold the 1977 decision in Abood v. Detroit Board of Education.